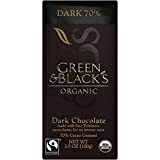 Green and Blacks Organic is USDA Organic, Fair Trade, and UN Certified Ethically Sourced chocolate. The rich taste comes from the full, dynamic flavor characteristics of Trinitario cocoa beans Every ingredient that goes into a Green and Black Organic bar is of the finest organic quality. Dark 70% chocolate is complex, intense, and aromatic. This bulk pack contains ten 3.5-ounce chocolate bars.